Transport for London has confirmed that as of October 13, it had 14 Class 345s built for its TfL Rail operations, with eight accepted for passenger use (345005-345012). Of those eight, three are in passenger traffic each day, with a further two deployed on driver training duties. The next stage of the ‘345’ project involves testing European Train Control System (ETCS) between Heathrow and Stockley (where the Heathrow Airport branch joins the Great Western Main Line). Network Rail has completed installation, and now a ‘345’ has been fitted with the system and software. It is undergoing testing at the Old Dalby test track, and was due to start in the Heathrow tunnels before the end of October. A second period of testing is planned for January. 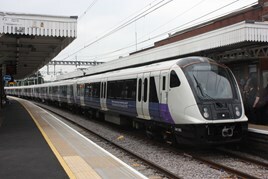 Seventy Class 345s are on order for TfL, and will ultimately be used for Crossrail. Currently they run between London Liverpool Street and Shenfield. A ninth (345016) has been delivered but is not yet passed for passenger traffic. These trains are a major improvement on the class 315 trains just like the 315 trains were when they were first introduced around 40 years ago ... Their wide walk through carriages means it's possible to either sit where you enter or if you prefer the seats build as forward / backward bays to walk along to see if one is available just like on Metropolitan Line S8 Stock. The trains also give a better ride and have air conditioning. The main clue that a new train is due is the departure indicators and station announcements say train has 7 carriages with no mention of carriages for old trains . Class 345s also have better accessibility from platforms although I suppose this is ongoing work . Ive been on the TfL Rail (Elizabeth Line) Class 345's. I quite like them. But is Bombardier starting to build the Class 710's for London Overground. I know that London Overground are ordering 45 brand new Class 710's that will be 4-Cars in length with a possibility of have a 5th car added to all of the Class 710's that will operate on the Lea Valley metro lines (Liverpool Street-Cheshunt, Enfield Town and Chingford), Gospel Oak-Barking line (with the extension to Barking Riverside) once the electrification is completed and Euston-Watford Junction DC line which will transfer the Class 378/2 to East London Line and North London Line services. Except for the Romford-Upminster line that Romford platform 1, Emerson Park and Upminster platform 6 has a short platform may not see new Class 710's to operate on in which I have heard that London Overground might actually keep few of the Class 315's for the Romford-Upminster branch line as the Class 315's are ideal for that line in East London which is in the London Borough of Havering. Or Bombardier to build few more Class 378 Electrostar "Capitalstar" EMU's that would be ideal for the Romford-Upminster line as Class 378 would be 4-Cars (classed as 378/1 or 378/2) and to operate between Romford and Upminster.